IoT solutions can be a hefty investment that you want to make sure to get right. Testing throughout the development lifecycle enables you to evaluate how well your IoT solution processes, manages, and presents device data ensuring project success. Azure IoT Device Simulation is a tool that you can rely on to help accelerate the testing and development of these solutions. Since its creation a year ago, Azure IoT Device Simulation has quickly become an essential tool in the developer’s toolbox. We are thrilled to announce the latest update to Azure IoT Device Simulation. This latest release highlights our continued investment in the vital IoT simulation space and is available now. Device Simulation is an open source project that you can deploy directly to your Azure subscription. The solution includes a web-based interface and a rich API allowing you to create powerful IoT simulations pushing realistic telemetry to your IoT Hub. Device simulation helps you build simulated devices that look and behave like the real thing. With Device Simulation you can gather, process, analyze, and act on data from simulated devices allowing you to test your solution’s functionality and reliability. Test your analytics pipelines, business process integrations, operator dashboards, and more by using simulated devices for near end-to-end testing. Scale test your software and build confidence in your solution by simulating both normal, peak, and beyond peak load conditions. Get up and running instantly by using sample devices and sample simulations when you care less about the actual data and just want to see data flowing through the system. Get a prototype up and running quickly to prove out an idea before investing in costly hardware. You can create custom devices through the UI to generate a prototype device in seconds. Make Device Simulation your own by modifying our open source code to meet your specific needs. Reusable device models: Device models can be saved, edited, and re-used across multiple simulations. Long-running simulations: Simulations can run for minutes to days, or run indefinitely until stopped. Mix and match device types: Simulations can contain multiple device types allowing users to mix and match types of devices in a single simulation. Improved visibility: See what your simulation is doing with integrated IoT Hub charts showing device counts, connected devices, and message counts. You can also view message throughput, total connected devices, and error counts along with simulation configuration details. Reusable simulations: Save your simulations and re-run them at any time from the simulation dashboard. JSON or Protobuf messages: Send telemetry from your devices using your JSON schema or send telemetry using the binary Protobuf format from your simulated devices. Get started with Device Simulation. 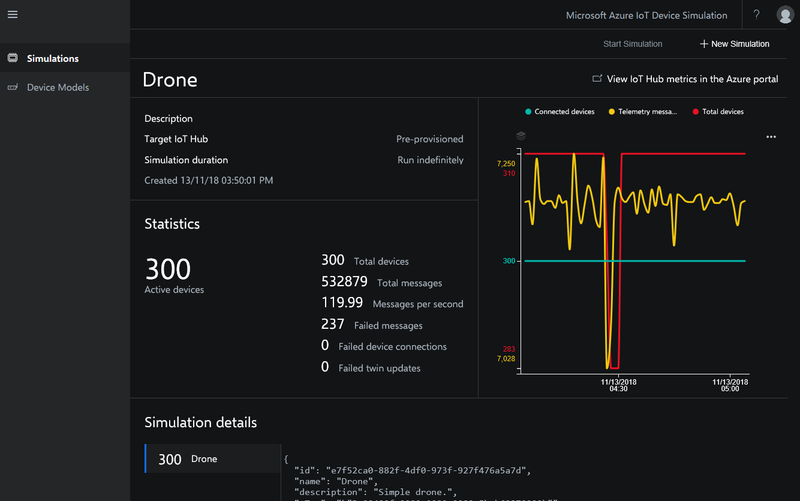 Learn more about Azure IoT Device Simulation capabilities.